Social Media Strategy and Planning – How to Do It Right? Social media is one of the most powerful tools used to raise awareness about your product, service, or company. A social media presence can leverage your business, bring in new clients, and strengthen your relations with existing ones. But only when you do it right. And we’re here to show you how. Let’s start with the basics. Your social media should be a part of a broader strategy. It sounds obvious, but for many marketers it still isn’t. Everything you post on Facebook, Instagram, and Twitter should be in line with your general marketing strategy. You don’t want to be like the current US president, with him tweeting one thing and then his whole staff trying to explain what he really meant. Before you start your social media activities you should ask yourself some questions. Why are you on Facebook, what do you want to achieve with it? Do you want to raise awareness about your brand, sell more products or services, provide customer service, or maybe all of the above? Only after you have these answers can you create an effective social media marketing strategy. What social media channels should your brand be present on? Almost everyone is on a social media but that doesn’t mean that your target group is on every social media channel. Of course, Facebook is a must. That’s because there’s 1.4bn daily users, which is too great of an opportunity to miss out on. The other services aren’t obligatory, but it’s good to be present on Instagram because of its visual power and Twitter because of its popularity in the US and opportunities for real-time marketing. Your presence on Pinterest, Tumblr, and other smaller social media channels depends on your target group. If they’re there, you should consider creating brand profiles there too. If not, why bother? You’ll just waste time and resources. Another important aspect of social media in your communication strategy is, well, communication. Having a dialogue. Your presence there shouldn’t be limited to posting offers or even funny images. Ask your audience questions and reply to their comments. Be there for them, entertain them, and bring them value. Your communication strategy also shouldn’t be set in stone. It will likely change with time, but you should still stick to some principles. For example, if you run a website selling vegan clothing, don’t post about your love of meat. Being consistent is always important on social media. People are sensitive to even the slightest sign of inconsistency and are ready to point it out. Trust me, there’s nothing worse than a full-fledged social media crisis. I know it’s a lot and it looks overwhelming. Fortunately there are some tools that can help you achieve success in social media. The other important aspect of a good social media marketing strategy is planning. You should create a content publishing calendar, and a great tool for that is Coschedule – it’ll make your strategy more transparent and efficient. One way to check your social media content strategy is to divide it into different segments. You can divide them by format: memes, video, graphics, links etc. The other division is by type: product updates, news, and so on. Some social media analytics tools like Sotrender can also help. At Sotrender, we offer an entire content strategy module. You can tag your content any way you want and see how different types perform against each other. The other important way to have establish a good communication strategy, both in general and in social media, is constant benchmarking. Compare yourself to your competitors. And don’t only compare your activities with your direct and indirect competition, but also with brands that are doing something extraordinary. Here’s a tip: don’t benchmark with the biggest brands like Coca-Cola or McDonald’s. Not many have the enormous marketing budgets they do. Think of companies comparable to your own and look for inspiration in the blogosphere. 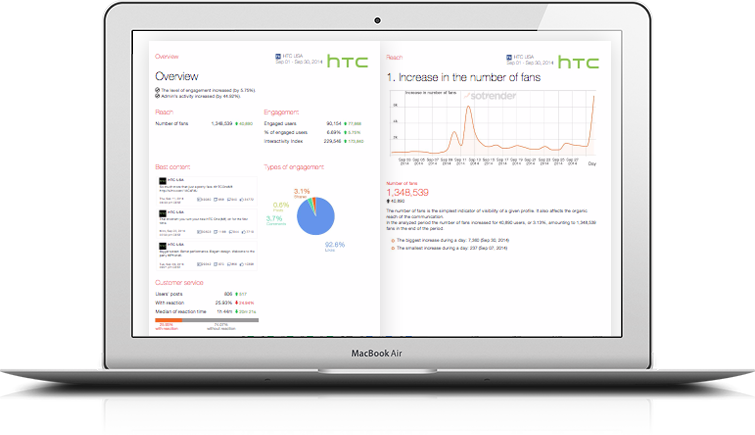 At Sotrender, you can look up what your benchmarks and competitors do. You can see how they are performing, what they posted, and you can even sort their posts in the same segments as your own. You can see what they’re good at (and improve here) and where they fail (and how you can avoid the same mistakes). This is just the beginning of creating and conducting an effective social media strategy. Do you want more? Subscribe to our newsletter!